LAKEWOOD, CO / ACCESSWIRE / January 3, 2019 / General Moly, Inc. (the ''Company'') (NYSE American and TSX: GMO), the only western exchange listed, pure-play molybdenum mineral development company, announced continued positive results of zinc, copper, and silver mineral intercepts from the final 4 holes of its 9-hole 2018 drill program in a skarn setting adjacent to the Mt. Hope primary molybdenum (''moly'') deposit. The 2018 drilling program encompassed 8,300 feet drilled in 9 holes in the skarn area, southeast of the Mt. Hope moly deposit located in central Nevada. Drill results for prior drill holes were reported in the Company's news releases of October 16 and September 4, 2018. Dr. Mark Osterberg, Principal Consulting Geologist of Mine Mappers, LLC, who is supporting General Moly in the exploration program, commented, ''The mineralized intervals reported to date, including those of MH-256 and MH-257, are bedding confined replacements of metasomatized Garden Valley formation limestones and calcareous siltstones. These mineralized bodies lie within the contact metamorphic aureole surrounding the structurally displaced, uppermost portion of the Mt Hope quartz porphyry intrusive, host to the Mt. Hope moly deposit. Sphalerite-bearing zinc mineralization is preferentially located within the outer two-thirds of the metamorphic aureole, and chalcopyrite-bearing copper mineralization was encountered primarily inside the inner third of the aureole. Chalcopyrite also straddles the contact between the Garden Valley formation and quartz porphyry stock itself as nested stockworks of thin, irregular and discontinuous, mineralized veinlets that in aggregate total typical porphyry-copper-type grade-thicknesses. The data obtained from the 9 drill holes MH-249 through MH-257 largely confirmed the historical results interpreted from drilling campaigns undertaken by previous operators including the U.S. Bureau of Mines, the operators of the historical underground zinc mines at Mt. Hope, Phillips Exploration, and Exxon Minerals. The assay results were prepared by ALS Limited and included certified reference standards, field duplicates, and blanks. All quality assurance controls were of customary accuracy and precision. The scientific and technical information in this news release was reviewed by Mark W. Osterberg, Principal Consulting Geologist of Mine Mappers, LLC. Dr. Osterberg is a ''qualified person'' as defined by NI 43-101. He is a Professional Geologist, with master's and doctorate degrees in geology. Dr. Osterberg has extensive minerals industry experience that is relevant to the evaluation of the style and nature of mineralization described above. Statements herein that are not historical facts are ''forward-looking statements'' within the meaning of Section 27A of the Securities Act, as amended and Section 21E of the Securities Exchange Act of 1934, as amended and are intended to be covered by the safe harbor created by such sections. Such forward-looking statements involve a number of risks and uncertainties that could cause actual results to differ materially from those projected, anticipated, expected, or implied by the Company. These risks and uncertainties include, but are not limited to metals price and production volatility, global economic conditions, currency fluctuations, increased production costs and variances in ore grade or recovery rates from those assumed in mining plans, exploration risks and results, political, operational and project development risks, including the Company's ability to obtain a re-grant of its water permits and Record of Decision, ability to maintain required federal and state permits to continue construction, and commence production of molybdenum, copper, silver, lead or zinc, ability to identify any economic mineral reserves of copper, silver, lead or zinc; ability of the Company to obtain approval of its joint venture partner at the Mt. 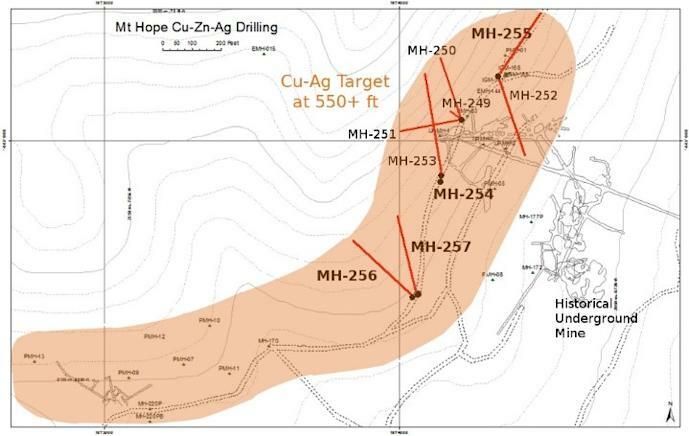 Hope Project in order to mine for copper, silver, lead or zinc, ability to raise required project financing or funding to pursue an exploration program related to potential copper, silver lead or zinc deposits at Mt. Hope, ability to respond to adverse governmental regulation and judicial outcomes, and ability to maintain and /or adjust estimates related to cost of production, capital, operating and exploration expenditures. For a detailed discussion of risks and other factors that may impact these forward looking statements, please refer to the Risk Factors and other discussion contained in the Company's quarterly and annual periodic reports on Forms 10-Q and 10-K, on file with the SEC. The Company undertakes no obligation to update forward-looking statements.